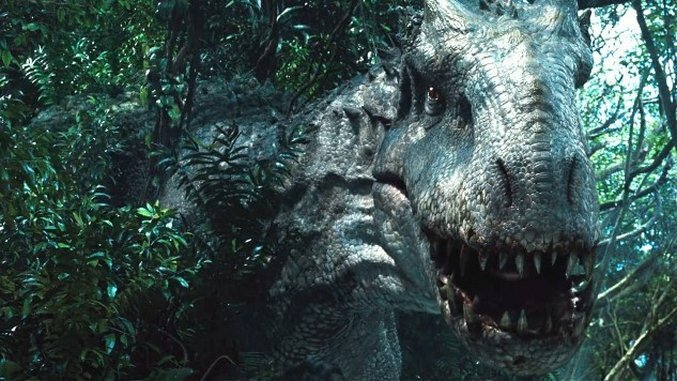 Jurassic World’s Antagonist Problem: Can Dinosaurs Be “Villains”? It’s been 13 years since the last time audiences set foot within the dream space of the Jurassic world, and in that time, much has changed. CGI and 3D effects ascended to a new level via Avatar. The world forgot most of the franchise-deflating disappointments of Jurassic Park III. The fictional John Hammond passed away alongside the actor who brought him to life, Richard Attenborough. And along the way, Hollywood apparently forgot what the first film was all about—but are you really surprised? The original Jurassic Park, in no uncertain terms, was one of the formative films of my youth. I was seven when it came out in 1993, too young perhaps to go see the film in theaters, but I soon saw it elsewhere. And then saw it again, and again. I’d already gone through the dinosaur phase that so many young boys find themselves engrossed in, but it probably hit me a bit harder than most. There are photos of me in a third-grade classroom wearing a floppy fedora and blue shirt like Dr. Alan Grant from that first film. Other kids can be seen in the background wearing lab coats or chefs hats. It was some variant on “what do you want to be when you grow up?” day. And I was there to represent the rootin’, tootin’ Action Paleontologists of Jurassic Park. And so, please realize it comes from a place of love when I say that Jurassic World has me worried. Not about things so paltry as the CGI, which whipped up a big fanboy conversation when the first trailer was released last year, but about things I believe are much more integral to its success. In chief, I’m concerned about the issue of antagonists. Because to have an “evil” dinosaur as a villain is a radical departure from the spirit of the original, and I’ll do my best in this space to explain why. First, let’s agree upon one thing: The dinosaurs of Jurassic Park are neither good nor evil, because they’re animals. An animal cannot truly be evil, because to do so requires knowledge of good and at least the suggestion of sentience. Even the raptors of the original film, so often lauded for their intelligence, don’t engineer their own escape and aren’t truly “evil.” They may be more capable, but they’re still just animals, doing what comes naturally to them. In that way, they’re essentially outside of blame for their actions—it’s always the fault of man when he comes into contact with them. Don’t want to get eaten by raptors? Then don’t create raptors and free them from their paddocks to run amok—that’s just asking for devouring via raptor. This is a single instance of Jurassic Park’s greatest recurring theme, as it’s casually laid out by Jeff Goldbum’s Ian Malcom during the guided tour of the island: chaos theory. The concepts of chaos theory crop up constantly throughout the film as we’re reminded over and over again that man, as a species, thinks he has a great degree more control over his surroundings than he really does. In reality, the complex systems of fate, chance and unknowable variables all operate on levels completely beyond our understanding, and any attempt to control them is hopeless. It’s not just about the dinosaurs figuring out how to breed—it’s everywhere. Hammond’s choice to employ Wayne Knight’s Dennis Nedry is a prime example: Hammond believes he can control all of the interconnected systems at his fingers, including the people, but there’s always a spanner in the works. One failure in that system—whether it’s the greed of a Dennis Nedry or the shut-down of an electric fence—and you’ve got an unbalanced equation spinning toward a deadly conclusion. The point is, in Jurassic Park, it’s always man and his hubris that is the villain. It’s something the second film, The Lost World also understood for the most part, but was lost by the time Jurassic Park III came out, to the series’ detriment. And in Jurassic World, it’s the new ” Indominus Rex ” that raises similar concerns. On a surface level, yes, it’s more of the “man’s folly” theme to think they can muck about with genetics and create a new dinosaur species for the sake of marketability. But who will be assigned that responsibility and consequences? Certainly not Bryce Dallas Howard’s park operations character—you don’t bring in a beautiful Hollywood actress to play that role, because an attractive character immediately engenders underserved audience sympathy—that’s just Audience Manipulation 101. Irrfan Kahn’s businessman character seems to be the closest in tone to what one would expect to find, but none of the materials so far have suggested he plays a major role in the film, certainly not like Hammond or the lawyer Donald Gennaro in the original. Beyond that, though, the potential problem lies with the capabilities with which they’ve imbued this new dinosaur. In short, they’ve transformed it from an “animal” into a “monster.” While an animal simply does what’s in its nature, a monster plots. It schemes. It has motives and the capacity for evil. We can see from the two trailers that the Indominus Rex engineers its own escape, so it’s clearly smarter than even the velociraptors. And according to Chris Pratt in the Super Bowl spot, “it’s killing for sport,” rather than self-preservation. What we have here isn’t an animal—it’s a dinosaur serial killer. You may be asking why it matters, whether the Indominus Rex is an animal or a monster; whether it’s a hazard or a “villain,” and the answer is this: It matters because if the creature becomes a villain, it immediately becomes subject to an entirely different set of storytelling tropes that Hollywood rarely, if ever, deviates from. In more ways than one, it robs us of any unpredictability in the story structure and conclusion. If the Indominus Rex is central, it shackles its story arc to the plot while simultaneously minimizing the importance of every other dinosaur—it becomes the only one that matters. Consider the climactic scene of the original Jurassic Park. As the raptors close in on the heroes, things look hopeless for a moment before they’re suddenly saved by the T-Rex’s appearance. It’s a genuinely surprising moment because the audience has no reason to expect that the T-Rex is about to suddenly show itself. It’s never been implied that this one creature is central to the plot, and nothing dictates that it would have to be there in the closing moments. It hasn’t been given a personality and thus, convention doesn’t dictate that it have a closed story arc. In Jurassic World, on the other hand, we already know months in advance that the Indominus Rex will need to be thoroughly “dealt with” for a conventional conclusion. The story is structured around it as its main narrative gewgaw, which means the storytellers’ hands are tied. What choice do they have? Allow me to offer an example from another, seemingly unrelated film series: 28 Days Later and 28 Weeks Later. The rage virus infected of the first film were a terrifying modern spin on the old zombie structure, an outward manifestation of man’s barbarism, unstoppable and uncaring in their anonymity. Their anonymity is key to the metaphor. The sequel, however, did away with that by making the father of the two protagonist children one of the infected. Suddenly, instead of the threat of the unconquerable hoard, you have a named enemy who repeatedly shows up to stalk them, making it closer to a slasher film in motif. All of the other infected immediately become pointless to the story—if you’re at all familiar with Hollywood story structure, you know that the anonymous infected are no longer a threat if the primary antagonist hasn’t yet been dealt with. Until he’s dead and his story arc is closed, the audience is simply waiting for him to show up again. We know that the conclusion must involve that one infected guy in one way or another because that’s simply how stories work—he’s like Chekhov’s zombie. One can only hope that the Indominus Rex isn’t bound quite so tightly to convention, for the sake of being surprised for once. Obviously, this is all hearsay for now, simply based on what we’ve been able to observe in the film’s promotional materials. I have no doubt that Jurassic World will likely still be an entertaining film, but it’s safe to say that ideally, I’m still grasping for that transcendent experience a seven-year-old me derived from the original. I’ll continue to hope that I’m wrong about the misgivings prompted by an extensive education in film—but I doubt it. Hollywood would have to evolve far more than an Indominus Rex to subvert its own predictability. Jim Vorel is Paste’s news editor and resident dinosaur geek. He studied film and journalism at the University of Illinois, so please keep that in mind as you compose a comment about his total lack of understanding in either of those fields.